The 2014 Jeep Patriot is unmistakably from the Jeep garage, as demonstrated by its squared-off lines, seven-slot grille, and round headlights. Both the Patriot and its slightly more compact sibling, the Jeep Compass, are based on a car platform, but still provide at least moderate off-road ability. In fact, when suitably equipped, the all-wheel-drive Patriot earns Jeep Trail Rated 4×4 capability. First launched for 2007, along with the Compass, the Jeep Patriot was significantly updated for the 2011 model year with fresh styling, upgraded suspension and steering, and new interior materials. Changes were few for 2012, while 2013 brought a special Freedom Edition to honor members of the military. For 2014, a new 6-speed PowerTech automatic transmission, with Auto Stick, has replaced the previous continuously variable transmission (CVT) as an option. A special off-roading transmission (CVT2L) remains available. Newly standard are seat-mounted air bags for front occupants, which previously were an option. The four-door Patriot has plenty of room inside. There’s adult-size headroom and legroom for rear-seat passengers. The 60/40-split rear seat folds flat, and a flat-folding front passenger seat is optional. With all the seats flat, you could slide an eight-foot kayak inside, for example. Two four-cylinder engines are offered for the 2014 Patriot. Our preference is for the larger of the two, a 2.4-liter four-cylinder that makes 172 horsepower and 165 pound-feet of torque. Fuel economy is an EPA-estimated 23/28 mpg City/Highway with the 5-speed manual transmission and front-wheel drive, which are standard equipment. All-wheel drive and the 6-speed automatic transmission drop the estimate to 21/27 mpg. The 2.4-liter delivers good power; put the pedal down even while cruising uphill at 75 miles per hour, and it will accelerate with reasonable haste. The smaller engine is a 2.0-liter four-cylinder, which makes 158 horsepower and 141 pound-feet of torque and is EPA-rated at 23/30 mpg City/Highway with the manual transmission and 2WD. With an automatic, the EPA estimate for the 2.0-liter drops to 21/28 mpg City/Highway, narrowing the gap further. Incorporating a crawl ratio for heavier-duty off-roading, a special continuously variable transmission (CVT2L) is optional on all-wheel-drive 2014 Patriot models with the 2.4-liter engine and Freedom Drive II package. This package gets an EPA-rated 20/23 mpg. In addition to its prowess for daily driving, a Patriot is light and nimble on twisty roads. When maneuvering around town, turn-in is sharp. The body is well isolated from the wheels: You can hear the tires hitting the expansion strips on the freeway, but you can’t really feel the impact. The independent suspension works well. We found the Patriot delivered steadiness and comfort during a long day of driving on patchy two-lanes, hard-packed dirt roads, sandy off-road trails, shallow rivers and deep gullies. The Patriot is available with front-wheel drive or a choice of two all-wheel-drive systems (including the one that Jeep qualifies as Trail Rated). Those who like to go off the pavement (or tow more than 1000 pounds) should choose the Trail-Rated Freedom II AWD system. This uses gearing 20-percent lower than the other models for steeper climbs and descents. But be warned: if you mistake it for a 4WD with a low-range transfer case, like a traditional Wrangler or a big Grand Cherokee, you’ll soon find yourself well and truly stuck. The 2014 Jeep Patriot comes with front-wheel drive or all-wheel drive, with a choice of two engines and either a 5-speed manual or 6-speed automatic transmission or a continuously variable transmission with a low ratio for rugged terrain. Patriot Sport 2WD ($15,995) comes with cloth upholstery, carpeting, fog lamps, tinted glass, manual-opening windows, reclining front seats, 60/40-split folding rear seat, cruise control, smart-key engine immobilizer, and an AM/FM/CD/MP3/WMA four-speaker stereo. (Air conditioning is not included.) A Sport front-wheel-drive model can be equipped with the 2.4-liter engine ($495) and 6-speed automatic transmission ($1,200). Patriot Sport AWD ($18,295) is equipped the same but comes standard with the 2.4-liter engine, all-wheel drive, and rear disc brakes that replace the rear drum brakes on the standard model. Options for Patriot Sport models include air conditioning ($995), 17-inch aluminum wheels ($795), and UConnect 230 radio with 6CD/DVD changer ($525). An All-Weather Group combines tow hooks, engine block heater, floor mats, daytime running lights, and aluminum wheels with P215/65R17 tires. Patriot Latitude 2WD ($20,195) comes standard with the 2.0-liter engine, while Latitude AWD ($23,595) includes the 2.4-liter engine and rear disc brakes with the all-wheel drive. Both Latitude models upgrade standard equipment to include air conditioning, power windows, driver’s seat height adjustment, fold-flat front passenger seat, heated front seats, heated power mirrors, remote keyless entry, UConnect 130 AM/FM/CD/MP3 radio, 115V outlet, and P215/60R17 tires on aluminum wheels. Options include a ratio upgrade ($695), UConnect voice command ($495), Boston Acoustics speakers ($650), All-Weather Capability group ($795), Sun/Sound group ($1,395), Security & Cargo Convenience group ($695), and tow package ($278). Patriot Limited 2WD ($23,995) and Limited AWD ($25,995) both come standard with the 2.4-liter engine and 5-speed manual or 6-speed automatic transmission. Also included are four-wheel disc brakes, automatic-temperature climate control; leather-trimmed seat upholstery; a 6-way power driver’s seat; bright bumper inserts; bright cargo side rails; and a Media Center 230 AM/FM radio with 6-CD/DVD changer, audio jack, and SiriusXM satellite ratio. Safety features on all Patriot models include dual front airbags, head-protecting curtain side airbags, torso-protecting front-seat side-impact airbags, ABS with electronic brake-force distribution, traction control, electronic stability control with rollover mitigation, and active front head restraints. Optional all-wheel drive can improve handling stability in slippery conditions. The Patriot has Jeep's favorite styling cues, namely round headlights and seven vertical openings for a grille, in a boxy shape with a fairly upright windshield and rear hatch. Unlike jelly bean-shaped competitors, Patriot's box shape translates to a more spacious feeling inside because the roof doesn't curl in on you. In addition, the vertical rear end allows more cargo inside and better sheds snow and ice in the winter. Dimensional differences between Jeep Patriot and Jeep Compass amount to only a couple of inches. Coupled with the variations in design touches, though, it's enough to give each of those models a distinct character. A bit of additional height on the Patriot is especially noticeable. Patriot Latitude feature more bright trim, but we think the body-color trim of the other models is more visually appealing and more befitting a Jeep. Tow hooks and roof-rail crossbars are optional. We'd prefer the fog lamps to be farther apart, but that observation falls into the nitpicking category. The appearance of the Patriot has changed little since model year 2011. Although it's acceptable for trucks and genuine four-wheel-drive vehicles to have lots of mechanical bits visible underneath, it's less desirable in a compact crossover. To that end, the rear bumper on the Patriot is quite deep and almost totally hides the muffler, which looked like a large industrial afterthought on 2007-2010 models. Jeep Patriot is considered a compact, although it looks larger. With a lot of space between front and rear wheels and overall length less than 15 feet, the lack of bodywork beyond the wheels adds dimension and improves backcountry accessibility. It's only a couple of inches away from identical height and width, and the Patriot's ground clearance matches that of many heavy-duty pickup trucks. The standard Patriot Sport wheels are 16-inch steel. Attractive 17-inch aluminum wheels are standard on Latitude and Limited models, and optional for the Sport. The Patriot looks much better with the aluminum wheels. Or, get your own when the tires wear out and use the original steel wheels with dedicated winter tires. A high seating position gives the Jeep Patriot driver a commanding view of the trail, the street, or the highway. A surprisingly comfortable driver's seat provides massive headroom, good thigh support, but so-so back support. The Patriot Sport's front seats have manual adjustment and come with cloth upholstery; the Latitude has heated cloth seats, which we prefer for four-season comfort. The Limited gets leather-trimmed upholstery, which might amount to overdressing the Patriot; but it does add an inviting bit of class. Rear occupants endure harder cushioning than those up front, but have plenty of space to stretch out. The center rear spot would be acceptable, except for a huge front console that protrudes into the rear foot area. The cabin layout is functional and roomy. The dark dashboard and instrument layout is simple, and the gauges are a tidy white-on-black with glowing orange needles. The speedometer is small, however, with small numbers, and it is not so easy to read unless it's illuminated. The door handles are easy to use. Soft-touch panels line the tops of the doors, and their pockets have clean edges. The three-spoke steering wheel has integral cruise and audio controls. The sound system controls are easy to understand and operate. Jeep says the available UConnect Tunes system can hold up to 6700 songs, which can be ripped from a CD or USB memory stick. We thought the doors sounded somewhat tinny when they were closed. Simple-as-can-be climate controls continue the uncomplicated approach taken in the Patriot's interior. A small but high-mounted information screen sits on the instrument panel, ahead of the driver. The Patriot's hand brake is strictly mechanical and practical, in stark contrast to the electronic brakes that have appeared on so many models. For storing your stuff, there's a nice tray over the good-sized glove compartment that's big enough for books. The space between the front seats includes a nook for change or cell phones, plus two fixed cupholders. The center console is split for two levels of storage and is padded. Door pockets are on the small side, but they can hold six CD cases; much of the space is taken up by the 6×9-inch speakers. The standard rear seat is a 60/40 split and it folds flat easily. Simply flip up the seat cushion and flop down the seatback. Reclining rear seats are optional. Upper-level models get a flat-folding front passenger seat. With the rear seats folded flat, there's a spacious 53.5 cubic feet of cargo capacity. Fold down the passenger seat, and the Patriot has room for something eight feet long. With all the seats in use, there's 23 cubic feet in the back, comparable with the space in any compact SUV. There's a nice cargo cover, though using it would significantly limit the storage space below. The hatch glass does not open separately, but the hatch isn't heavy. Removable carpeting lines the cargo-area floor and hides a real full-size spare tire underneath, on most models. That cargo deck is a relatively high 31 inches off the floor. The maximum cargo height opening is 27.4 inches. Taller people should watch their heads when beneath the open hatch. Refreshing. That's the word that comes to mind after a session in the 2014 Jeep Patriot. At last, here's a vehicle that functions mainly as a car, without doodads and gadgets dominating the driving environment. After testing so many overloaded gadgetmobiles, the Patriot comes as a breath of welcome fresh air in a market that's changed substantially since it debuted as a 2007 model. Patriot almost drives and feels like a car from 20 years ago, but in a good way. That means modern ride comfort, capable handling, useful performance, and an overall satisfying driving experience. When appropriately equipped, the Patriot can also handle an impressive number of off-road duties, despite lack of a two-speed transfer case. 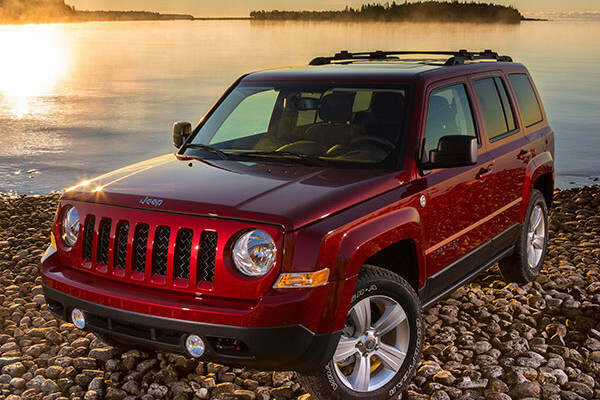 The 2014 Jeep Patriot comes with a choice of engines, and the larger 2.4-liter engine works best. It has good power, with 172 horsepower and 165 pound-feet of torque, and is responsive where it needs to be. Our only criticism is that it sounds gruff under heavy throttle. Fuel economy for the 2.4-liter engine is an EPA-estimated 23/28 mpg City/Highway with the manual transmission and front-wheel drive. The 2.0-liter engine offers a bit less power and slightly better fuel economy. The 2.0-liter engine makes 158 horsepower and 141 pound-feet of torque and is EPA-rated at 23/30 mpg with the manual transmission and two-wheel drive. The smaller engine needs to be revved quite a bit to make power, however. So, for the roughly $500 price difference and the extra torque, we recommend the larger 2.4-liter engine. The new 6-speed automatic transmission is well-behaved and delivers no unpleasant surprises. Equipped with a shift gate, it permits gear changes by feel, unlike some that require you to look down or ahead at the instrument panel to see which gear you've selected. The 5-speed manual gearbox is a joy to use, despite long throws. The lever comes out of the center stack above the driver's right knee, which is an improvement over being on the floor near the right thigh. The 5-speed makes the Patriot feel like a Jeep. Properly used, it brings out the potential of the engine. On paved country roads, the Patriot feels light and nimble. The ride is steady over rough asphalt patches. The body feels well isolated and you can hit a bump with one wheel without your head being tossed. The Patriot's suspension works well in all conditions. We drove it over a 20-mile stretch of dirt road: hard-packed, potholed, a layer of loose dust, with lots of uphill and downhill curves. The Patriot was stable and confident. We used the brakes hard on this dirt road; the ABS frequently activated on the slippery dust with the all-season tires. We aimed for some of the potholes, including a 50-foot-long row of little ones. The independent suspension eagerly ate them up. Along came a washboard surface, and the Patriot stayed true. We hit an elevated cattle crossing at 30 miles per hour and tensed for an impact that never came. The Patriot did a great job in these conditions. We also drove a Patriot with the Trail-Rated Freedom Drive II off-road package. It adds one inch to the ground clearance for a total of 9.1 inches, allowing a 29-degree approach angle, a 34-degree departure angle, a 23.7-degree breakover angle, and enabling the Patriot to ford 19 inches of water. Unfortunately, Freedom Drive II is not offered with the manual transmission. Both all-wheel-drive systems have a locking center differential that sends half the power to the rear wheels. They also have a brake lock differential that can shift the power from side to side on each axle, which is important in slippery terrain. The Freedom II package also gives the CVT a low range with a ratio of 19:1, good for crawling over obstacles. We tested a Freedom Drive II combination on an off-road trail in the Arizona desert, crossing some ridges and ditches that raised one wheel two feet in the air. It felt effortless, as the Patriot slowly and securely picked its way over. A sharp U-turn showed off the tight turning radius. In a sand pit, the off-road brake traction control dabbed the brakes of the slipping wheel or wheels for us and pulled the Jeep through. The Freedom II package includes Hill Descent Control that automatically engages when in Low range on steep downhill grades. It keeps the Jeep under 5 mph and under control when going down steep hills, even icy ones. You can take both feet off the pedals and let it do its thing. We hit a sandy gulley and floored it, racing up to 45 mph, engine screaming, and the CVT stayed in low range. Driving flat-out in a straight line over the washboard surface, with the wheels bouncing every which direction, the Patriot remained controllable, responsive and tracked true. We hit a couple of washboard curves, trusting in the stability control to keep the Jeep from bashing into the rocks, and it did. Below 35 mph, the electronic stability control only uses the brakes to keep the Jeep on the line; above 35 it also cuts the throttle, if necessary. Head/hip/leg room, f: 41.0/52.3/40.6 in. Head/hip/leg room, r: 39.9/51.0/39.4 in. Cargo volume: 53.5 cu. ft.